Annette Bening’s straight, brown hair is styled in a simple, elegant updo. Her w..
Annette Bening’s straight, brown hair is styled in a simple, elegant updo. Her wispy bangs give her face a more youthful appearance. Annette Wore this hairdo to the 36th Annual American Film Industry’s Life Achievement Award in Hollywood in 2008 where her husband Warren Beatty was being honored. Annette Bening’s straight, blonde hair is styled in an elegant, formal updo. Her..
Annette Bening’s straight, blonde hair is styled in an elegant, formal updo. Her wispy bangs give her face a more youthful appearance. Annette Bening’s brown hair is cut in a medium-length bob hairstyle. Layers and..
Annette Bening’s brown hair is cut in a medium-length bob hairstyle. Layers and curls give this look lots of volume. Annette wore this hairstyle to the world premiere of the Running With Scissors movie. Annette Bening’s brown hair is full of blonde highlights. Her short hair is cut wi..
Annette Bening’s brown hair is full of blonde highlights. Her short hair is cut with lots of layers to add volume and height. This hairstyle will make round faces appear thinner. Annette Bening’s brown hair is full of blonde highlights in this playful, curly hai..
Annette Bening’s brown hair is full of blonde highlights in this playful, curly hairstyle. There are lots of layers throughout the hair to create volume. 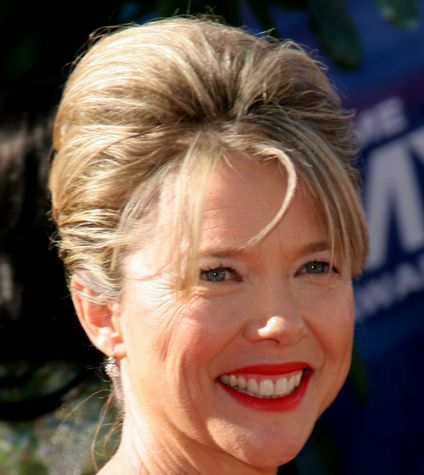 Annette Bening’s straight, blonde hair is cut in a short, spiky pixie hairstyle. To..
Annette Bening’s straight, blonde hair is cut in a short, spiky pixie hairstyle. To style, apply hair gel and dry with fingers.